Waterfalls are one of the many breathtaking wonders that nature has given us. Spruce up your landscape with a backyard waterfall from Nature’s Re-Creations in St. Louis to create an outdoor living space where you can relax, de-stress and entertain family and friends. 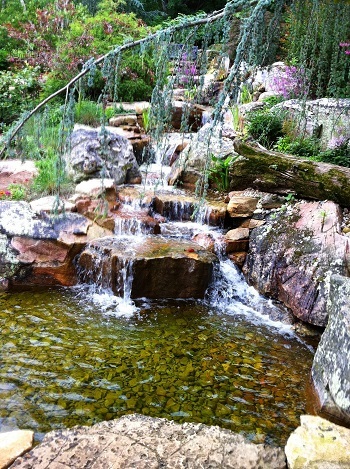 As one of our most popular outdoor water features, a backyard waterfall offers aesthetic natural beauty and tranquility. Just imagine the intriguing sights and sounds of splashing waterfalls in your very own woodland oasis. Nature’s Re-Creations can design and build a backyard waterfall for any outdoor space. Our waterfalls range anywhere in size from 1” tall gurgling rapids style fall to a 2’-3’ drop, depending on your site's elevation. All backyard waterfalls can be of various widths and are dictated by your personal desire and auditory preferences. Each set of falls that Nature's Re-Creations creates are uniquely different. Our goal is to re-create what would be seen in nature. Even if you have a 10’ hillside our team could break that up into several smaller falls to ease the installation and simulate the cascading effects seen in nature over a longer run. This provides more water action and reduces splash and water loss to evaporation. Creating a series of streams & falls allows for more creativity and a greater variance in each fall with regards to site and sound. Our backyard waterfalls can take the shape of a babbling brook or flowing stream with small rocks or even a thunderous waterfall with large boulders. Your choice of rock can even make a difference in the appearance and sound of your waterfall. You can also soften the look of your waterfall with a mix of aquatic plants or terrestrial plants for a more natural experience. Waterfalls and streams are typically sized according to space, budget and feature size. For waterfalls flowing into ponds, a large enough body of water must support the size of the stream & falls created. Pondless waterfalls can be custom sized as long as the basin is sized accordingly. At a minimum, the basin would need at least double the amount of water in motion in the stream & falls to operate properly. A backyard waterfall and stream can range from $500 to $1,500 per linear foot depending on size and complexity to start. Waterfall maintenance consists of occasional algae treatments – depending on sunlight and shade exposure – as well as aquatic plant pruning to ensure plants do not choke the stream. 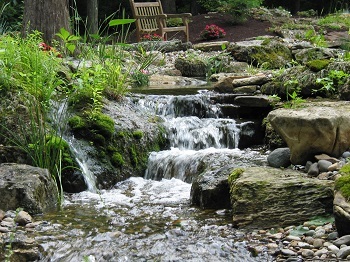 Not only does a backyard waterfall provide beauty and harmonious sounds to your water garden, but it also helps to aerate the water, providing better water clarity and retaining all of the beneficial bacteria that keeps your pond healthy and looking its best. A backyard waterfall offers more than just captivating beauty, it also harnesses a therapeutic power. There is something very magical about the ravishing falls that can cleanse the mind and sooth the soul. You lose track of time and think of nothing else but your surroundings and the wonders of nature. Contact Nature’s Re-Creations in St. Louis today at (636) 223-2330 for more information about a backyard waterfall. You'll end up with a remarkable waterfall that looks as if Mother Nature carved it herself!